Empire of the Petal Throne in hardcover and softcover – available now from DriveThruRPG. Order yours today! All of this for $19.95 for the softcover and $24.95 for the hardcover version. The Foundation has also updated the PDF version of the rules; this is still a picture scan of the rules, but it is precisely the same as the text included with the print-on-demand edition. We intend to make a text-searchable version available free to customers who have bought the PDF, as we move ahead with other projects. If you have ever wanted to see the original World of Tékumel roleplaying game – it can be yours right now! Just click on the link and order your copy today! The Foundation is going to produce print-on-demand maps to provide reprints of the stunning maps included in the original boxed set. We’re hoping to be able to release the maps of the City of Jakálla and the Eastern and Western maps of the Five Empires in the near future. We will also be updating the PDF version when we release the print-on-demand edition, to a version matching the print-on-demand edition. This will still be a picture PDF; the text-searchable version is in the works. The ebook for Professor Barker’s second novel, Flamesong, is the next project on our list – more news on that as it develops! The cover for the soon-to-be-released PDF and print-on-demand edition of Empire of the Petal Throne, from the Tékumel Foundation. This includes errata and maps not included in previous editions. Look for it soon! Happy Halloween! The Players Handbook is Available! Just in time for Halloween, the Swords & Glory Vol. 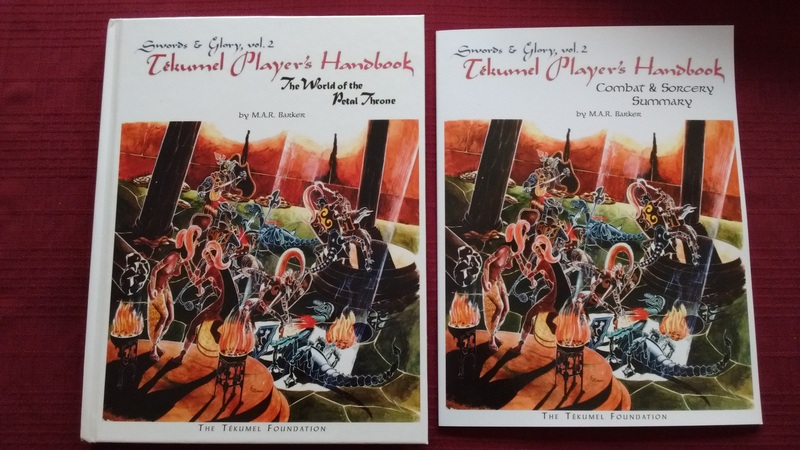 2 – Tékumel Players Handbook is now available, in PDF, softcover and hardcover versions. The Players Handbook adds a wealth of information about Tékumel beyond what was revealed in Swords & Glory Vol. 1 – Tékumel Source Book. It provides all of the information to generate characters for Swords & Glory, including warriors, priests, lay-priests, spies, officials, and more. A complete listing of spells and spell descriptions for mages of all temples is also provided. 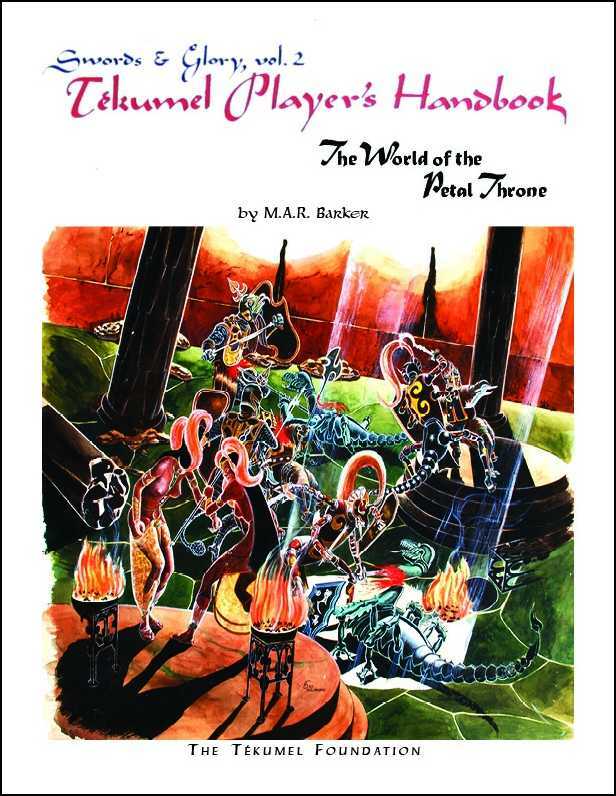 This is a reprint of the original Gamescience edition of the Tékumel Player’s Handbook, published in 1984 as a boxed set with additional material as Swords & Glory, Volume 2. The cover is a newly restored reproduction of the original box cover art, and has never been seen before! The new printing includes the character record sheet, errata for early printings, and the combat and sorcery summaries included with the original boxed set. Best of all, this release is part of a sale in honor of Prof. Barker’s birthday; print products and connected items and being sold at a discount through the end of November – a great opportunity to buy material to share with other gamers interested in the world of Tékumel. This is the third follow-up to our earlier blog post about plans for 2016 – we want to explain in more detail plans for products from Tékumel licensees for the upcoming year. If you have suggestions or would like to be more involved, please let us know! the Tékumel Project has new miniatures offerings, as well! The Foundation is always interested in hearing from potential game producers for the world of Tékumel. It is worth cautioning, however, that not every idea is easily produced as a game, or fits well within the Empire of the Petal Throne. But if you do have something for which you would like to get a “approved for Tékumel” license, please contact us! This is a second follow-up to our earlier blog post about plans for 2016 – we want to expand and explain in more detail plans for new products for the upcoming year. If you have suggestions or would like to be more involved, please let us know! The original “mimeo” Empire of the Petal Throne is available in PDF form, but we want to make it available in a print-on-demand format, as well. There are subtle differences between the playtest rules and the edition published by TSR, Inc. The Jakállan Underworld, including maps and a reproduction of the key – this project has been in the works for some time, as we have been deciding what would be the best way to present it. We now have a plan for that – and we think you will like it. The Dlash Gazetteer and maps of the city in southern Livyanu, which features so prominently in The Lords of Tsámra. Speaking of which, Flamesong and The Lords of Tsámra, in eBook and print forms. Having Professor Barker’s novels available is something many of you have asked for – and we want to fulfill your request. If we can fit it in, Armies of the Five Empires. This would include information from the original army lists, as well as the military articles published in various periodicals. There are other projects waiting in the wings: a Stability companion volume to The Book of Ebon Bindings, the Northeast Frontier maps and gazetteer, and other source material useful for gaming. We will get to these as time and resources allow. Help spread the word – run games, blog about your adventures, and share them with your friends. The more source material people buy, the easier it is for the Foundation to produce new material. This is a follow-up to our earlier blog post about plans for 2016 – we want to expand on that post, and explain in more detail our plans for the upcoming year. If you have suggestions or would like to be more involved, please let us know! U-Con Gaming Convention (Ypsilanti, MI), November 11th-13th. This advice is, if anything, more true today than in the past. What Prof. Barker wanted was for people to go out and play in his world, and then share the results with one another and with him. Trying to “get it right” is just falling down a rabbit-hole of needless worry. It’s understandable that players and game-masters would want to capture the essence of Tékumel, but that should include testing out your own Tékumel inventions and imaginings in actual gameplay. From time to time, the Foundation blog will present various excerpts and notes from Prof. Barker which should be of value to Tékumel fans. This is the first in that series; we hope to provide some insights into what he thought was worthy of consideration as you explore Tékumel, the world of the Empire of the Petal Throne. – The release of new material for Tekumel and re-release of out-of-print material for Tekumel. The Tekumel Foundation is a non-profit organization; all of our proceeds go to helping preserve and promote the creative legacy of Prof. Barker – the amazing world of the Empire of the Petal Throne! Congratulations to Danielle Goudeau and Choice of Games LLC! 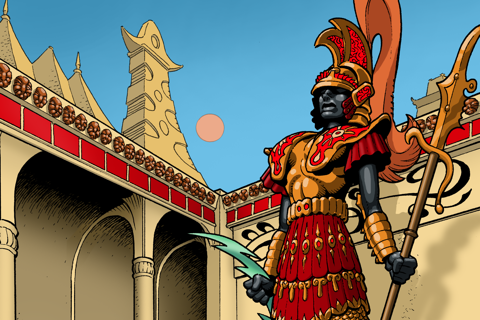 The Tékumel Foundation is very pleased to announce the release of Choice of the Petal Throne by Choice of Games LLC. Set during the Tsolyáni civil war following the death of Emperor Hirkáne, this interactive novel by Danielle Goudeau provides a new opportunity to enter into the world of Tékumel. In upcoming weeks, we plan on providing more background information about Choice of the Petal Throne, including a short interview with the author of the game. Until then we encourage you to go try this new game for Tékumel!